AUTHOR – Arun Krishnan was born in New Delhi, lived in Pune and studied in Los Angeles. He quit Mechanical Engineering in 1996 and smoking in 2001. Over the last ten years, Arun has worked in the media departments of two advertising agencies in New York City. He has also worked for Concern Worldwide, an Irish international relief organisation and IBM, an international for-profit corporation. SYNOPSIS – It's India versus Pakistan and as the excitement soars in the final over of a memorable cricket match, ten-year-old Siddharth sets off a firecracker. The blast that follows will change his life. Siddharth discovers that growing up isn't easy: he has to handle a tragic death, his best friend is gravitating to a rghtwing political party, and his film-maker father has troubles of his own as he shifts away from the commercial but lucrative world of Hindi movies. And Poona is nothing at all like Bombay. Will tennis matches help, or can his mother's beautifully retold myths do the trick? Will instant noodles come to Siddharth's rescue, or will it be his old elocution standby, The Charge of the Light Brigade? 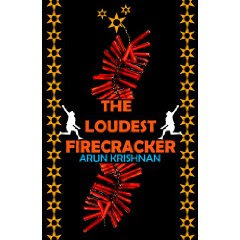 In this touching, poignant and often hilarious debut novel, Arun Krishnan has created a world we all recognise, one that will appeal equally to young adults and a more mature audience. An Honest effort to use writing as a medium of touching sensitive issues in the light of simplistic fiction. This one started a bit slow for me but soon grabbed my attention a lot. The central character is a 10 year Old Boy, and the book deals with his vision of the world around him. Its realistic, Its funny and yet very emotional. The story deals with his coming of age before time, as it happens to kids who unfortunately lose their parents in an early age. It make you ponder upon the bond that you share with your parents, The warmth of your mother, the coconut like compassion of your father.It also pulls you down your own memory lane when it deals with the long slow evenings of protagonist playing with his friends. Every aspect of narration from the third person speech at maximum places is sarcastic and hilarious and the same time intentionally touching a sensitive issue of the society, eventually leaving me in a flurry of emotions at many places. How straightfully we look at things when we are young and How complicated we turn them around us as we grow up is a lesson that every reader can learn when you see it from the vision of the author! I was glad to see someone attempting a work like on his debut novel. Childhood thought process and its innocence at its best is what one can expect with this one. Its a brilliant effort if not nessesarily a perfect entertainer book. Very unique from what young Indian author shelf usually provides you and I recommended you not to miss it and appreciate the attempted writing style. RATING – 3/5. Looking to read more intriguing works on the same lines by the young Indian authors, specifically those coming from the middle class. Someday I hope, the publishers look beyond campus stories to market debut works of writers like this. PS – Gifted to me by my elder brother. He speaks to me, by the course of what he gives me to read. Love his ways.